To Marry an English Lord is a well-written, informative, and highly entertaining peek into the lives of wealthy and aristocratic Americans and Brits in the late Victorian and Edwardian eras. Many parts read kind of like a Victorian People magazine, and the gossip is still as scorching now as it was 120 years ago! My only complaint is the format of the book, which is copiously illustrated and stuffed with so many info boxes and two page spreads on different details that it can be difficult to read. Hard to fault a book too much for providing too much information, though, especially when it’s as fascinating as this one! 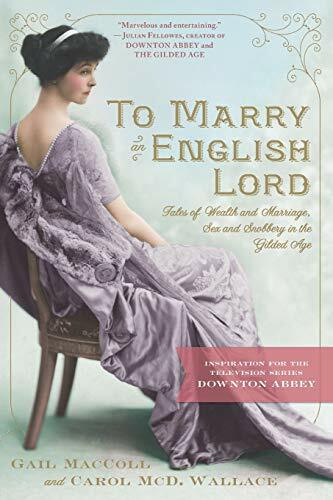 Originally published in 1989, To Marry an English Lord has been re-released as a result of the popularity of Downton Abbey, which features an Anglo-American marriage between Lord Robert and Cora Crawley that is similar to those described in this book. Correction: I love it for the humor, and the characters. Amelia, Emerson, Ramses, Sethos, and the rest are larger than life, but so entertaining and (frequently) adorable that they’re irresistible. Reading about their latest adventures is like catching up with old friends. Amelia and Emerson in particular are rumored to be part of the inspiration for the character of Indiana Jones, as well as Rick O’Connell and Evy Carnahan in The Mummy. Series author Elizabeth Peters, who died in 2013, had a Ph.D in Egyptology, so you’ll also learn interesting stuff about Egyptian culture and archaeology along the way.